When Fernand Belanger opened his Montreal, Que., business in 1965, he was a countertop pioneer working with particle board and laminate. Fifty-plus years later, cabinet doors have been added to the mix at this thriving shop in Boucherville, Que., a suburb of Montreal. Today, this location of Belanger Laminates is a manufacturer of postform countertops, thermoplastic doors and post-form doors in conjunction with additional operations for doors near Quebec City in Ste-Marie-de- Beauce. The company was purchased in 1998 by Holstein, Iowa-based VT Industries, which itself began life as Van-Top in 1956. At the time of the acquisition, Belanger had just moved to its current site. 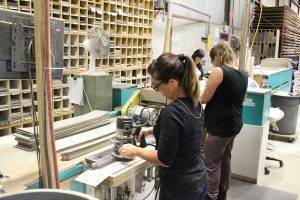 Over the years, the company has grown to be the largest post-former in Canada with approximately 200 employees dedicated to the manufacturing of products for kitchen, bathroom and furniture industries. 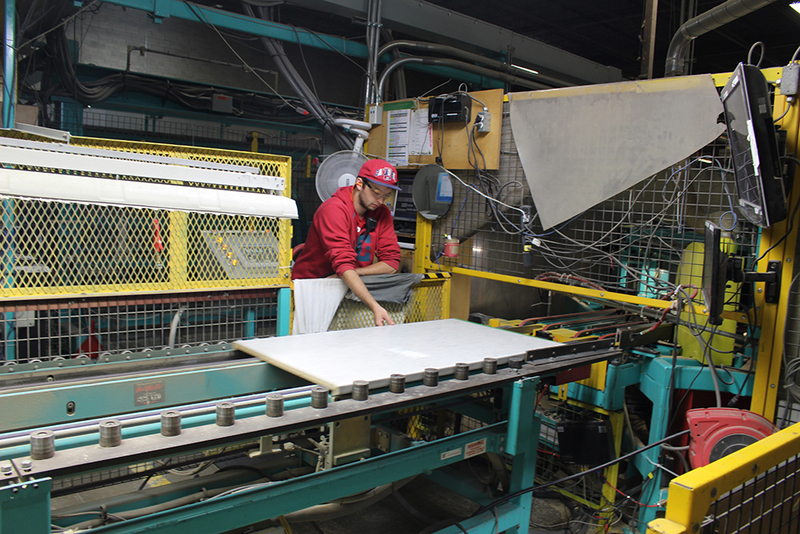 While cabinet door product accounts for 10 percent of the Belanger business, and has been running for only a few years, the highly automated line can produce 800 to 1,000 thermoplastic doors per day for custom kitchen cabinet makers and distributors. The countertop side accounts for 90 percent of the business with product sold at home centres across Canada and parts of the U.S.
“We do have a huge network in the Canadian and the U.S. markets of distributors or fabricators who push our countertop products, but also our thermo and polyester doors,” says Nancy Bedard, marketing manager at Belanger Laminates. 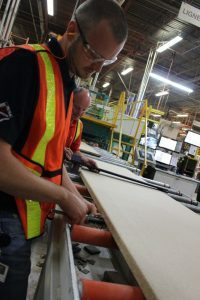 VT Industries, a company also driven by home-centre sales, saw Belanger Laminates as a natural fit since it had a similar go-to-market strategy that would mesh after the acquisition. 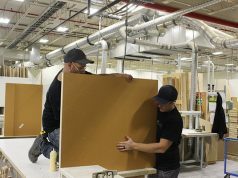 The Boucherville location encompasses 100,000 square feet with 150 employees, 20 of which are dedicated to door fabrication production, 100 on the countertop line and 30 in shared office services. 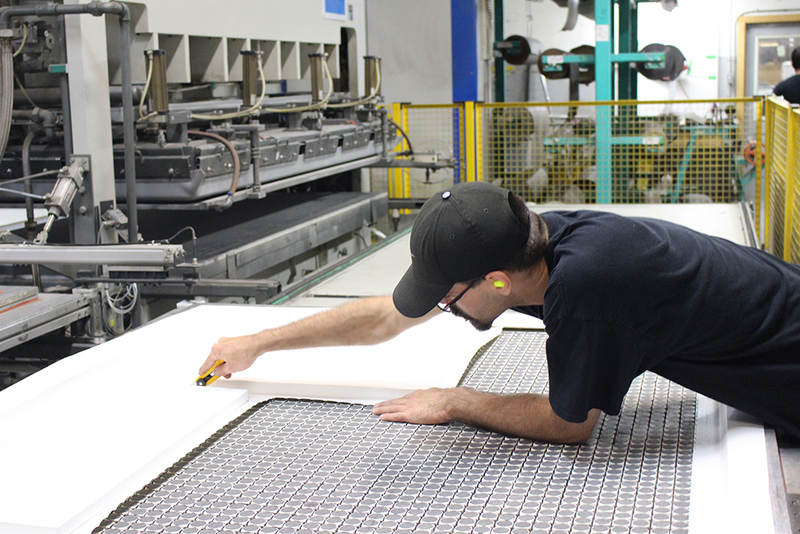 Countertop production ranges from 80,000 to 100,000 linear feet per week. 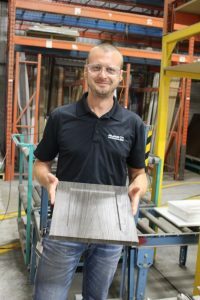 Simon Roy, production manager at Belanger Laminates, notes that door production includes close to 75 different colours and 70 different standard styles. But when custom orders are accounted for, there is an almost unlimited variety of different styles, adds Bedard. “The production guys like that,” Roy laughs. Polyester door production ranges from 400 to 600 doors per day at the Ste-Marie-de-Beauce plant, adding to the variety available with 40 colours in four models, including one model that is exclusive to Belanger. Some employees have over 40 years of experience at the facility, with many in the five, 10 or 15 years-of-service bracket. The company also has a human resources department that searches for the “right people to work in the right department,” says Bedard. “We consider employees as family, not just employees.” The company has an “open concept” where there is constant communication between managers and employees. Communication is key to day-today operations of the Boucherville plant. “In every department at the beginning of a shift the supervisor meets with all of their employees,” says Roy. “Every morning there is a couple of minutes where you can exchange ideas and at the same time learn about the performance of the previous working shift — what happened that was bad and what was good — and what we need to do today.” The management team also sits down for 30 minutes with all the supervisors every morning to make sure everything is on track and share their ideas, he adds. “To see who needs help that day, for example. Employees cannot, however, make changes to process without first discussing them through the proper channels. Training is delivered on-the-job and through a safety committee that gets information to employees. Management will also take courses at a local CEGEP on how to manage their team. “All of our foremen and supervisors grew into their positions on the job from the shop floor — I am one of these guys,” says Roy. 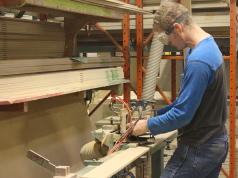 “I started by pulling sheet to make laminate countertops and grew up with the company. There’s a couple more people like that now and we always try to give them the tools we can for success.” Roy himself took leadership courses to prepare for managing employees. VT believes in automation to the extent that it has a department of automation and has spent a lot of money to automate production lines, especially its countertop operations. The postform countertop line is known as its super line and the company has seven of them across North America. To maintain quality among the fabricators, the Countertop Pro Team Association was formed, according to Bedard. 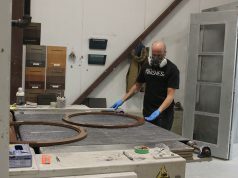 Partners include Belanger, Arborite, Les Cuisines Tech Profab, Formica, Wilsonart and Tafisa. Suppliers like Belanger also have to maintain high quality standards, “from getting the particleboard on line to stacking the countertop on the customer’s skid,” says Bedard. Helping meet quality goals is the company’s investment this year in an automated, programmable CNC machine and work cell for machining and handling MDF doors. “Because it’s an automatic stacker, loader and unloader, it is much easier for the operator now,” says Roy. 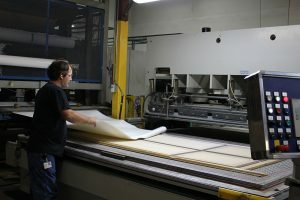 Belanger has doubled the capacity for machining doors, as well as increased the quality, he adds. 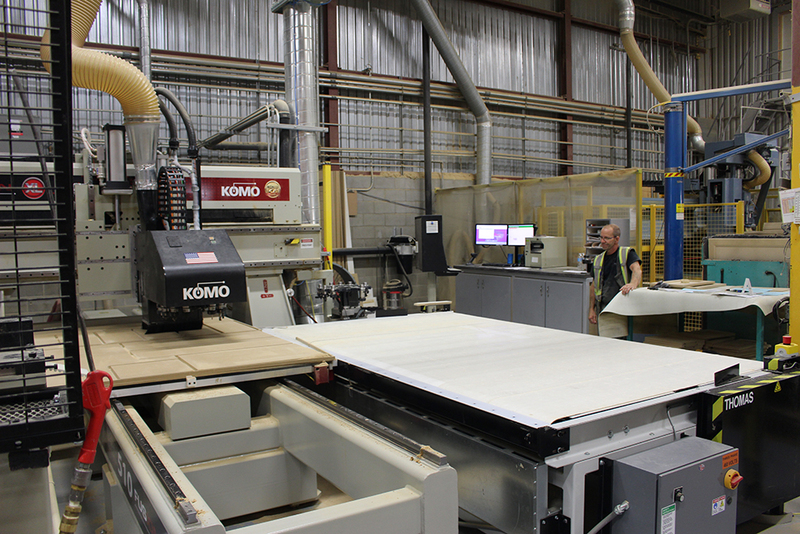 “I think we also made a good choice with Cim-Tech (CAD/CAM software) to run the CNC machine. 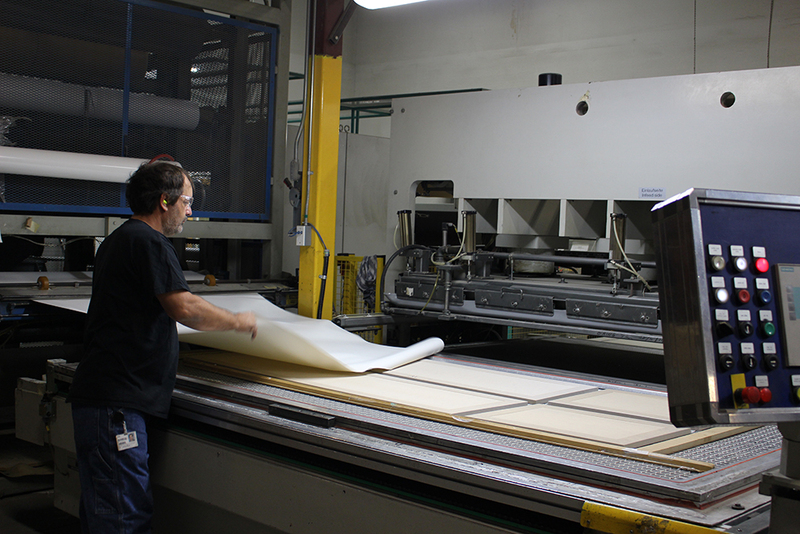 Its advanced technology provides us the easiest way to do the nesting.” Nesting software from the Orlando, Fla.-based company provides the machine tool instructions that maximize the yield from each MDF sheet, thus reducing scrap. Belanger is constantly updating its designs to the software due to the cabinet door business being very customoriented. “We can’t automate the whole line because orders are not standard,” according to Roy. “We go through 80 to 150 orders per day in all different sizes, colours and styles. We have to process those orders one at a time in the most efficient way we can do. Market requirements dictate that often the kitchen design is mix and match. This means the customer sometimes requests different colours and models of doors in a single order, where she wants to see darker bottom cabinets and gloss white doors on top, something that Belanger’s thermo doors can easily address. In addition, the combination of CNC plus some manual work can process door mouldings. “We have a collection that has moulding integrated in the door so we have to make the moulding after the door has been shaped,” says Bedard. Belanger Laminates recognizes the need for customer education and produces brochures, colour charts and a glossy consumer magazine twice a year. “They need to understand what we have to offer. We want to make sure the consumer knows how good a laminate countertop is, and how good a thermoplastic door is. 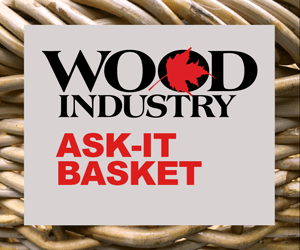 We are trying to educate the consumer before they go out and buy,” says Bedard.